When the Dalai Lama returned from his trip to Beijing in 1955, five years had passed since the Chinese had invaded Tibet's easternmost province, in October 1950. Mao at that time had decided to make Tibet a part of China for nationalistic and geopolitical reasons and was willing to do so entirely by force if need be, although he preferred to accomplish it through "peaceful liberation"-that is, through a written agreement with the Tibetan government/Dalai Lama. Mao understood that Tibet was unlike all other areas that Beijing sought to "liberate," in the sense that after the fall of the Qing dynasty, despite Chinese claims that Tibet was part of China, it operated as a de facto independent country. Not surprisingly, the Tibetan government did not want to be "liberated" and had deployed most of its armed forces-about six thousand regular and militia troops-to defend the Sino-Tibetan border (the Upper Yangtze River). After you take Chamdo, leave only three thousand of our people there during the winter. Do not get to Lhasa this year. Withdraw our main forces to Ganzi [Xikang Province]. From the Tibetans' point of view, they may take this as a friendly gesture by us. The Tibetan government responded to the defeat by moving the Dalai Lama to the Indian border, where he could easily escape if the Chinese invasion continued toward Lhasa, and by desperately trying to secure assistance from countries it had dealt with in the past, such as Britain, the United States, and India, as well as the UN. Tibet, however, received no assistance. The West was fighting to stop Communist aggression in Korea, but would not do the same for Tibet. That left the Tibetan government with two bad options: to fight militarily as best they could until the end, or to negotiate to secure whatever they could. The PLA had over one million battle-hardened troops in uniform at that time, about forty thousand of which were actively participating in the Tibet campaign, so conventional warfare against the PLA, as Chamdo had demonstrated, stood no chance of success. However, a guerrilla strategy might well have been effective given Tibet's high altitude, difficult mountain terrain, and total absence of motorable roads. Supplies for a PLA force invading Lhasa from Chamdo would have had to be sent over 650 miles on pack animals, so coordinated guerrilla attacks might have slowed down the PLA's advance and bought more time for the Tibetan government to garner support from the international community and the UN. Tibet, however, did not do that, because it was not prepared to organize and implement a guerrilla strategy. After it became a de facto independent polity in 1913, Tibet had consciously declined to modernize. In particular it had refused to create a modern and effective army and so had no professionally trained military corps in 1950. Its generals and commanders in chief were regular government officials who were appointed for short terms to these military positions and had virtually no special military training or experience. Not surprisingly, no contingency plans had been prepared to oppose the PLA through guerrilla warfare should the Chamdo army be defeated. Consequently, with its army decimated, its morale low, and the PLA poised to launch a full-scale invasion of its heartland, the Tibetan government and the Dalai Lama opted to negotiate and reluctantly sent two delegations to Beijing, one from Chamdo headed by the captured governor general, Kalön Ngabö, and another from Yadong (Tib. Tromo) through India. They arrived in late April 1951. The Tibetan representatives had no real negotiating points, so they agreed to start the discussions using a ten-point Chinese document that laid out terms for what a peaceful liberation agreement might look like. This document, initially drafted by the Southwest Bureau under Deng Xiaoping,embodied the core of Mao's Tibet policy and was the carrot in Mao's carrot-and-stick strategy. It became the basis of the Seventeen-Point Agreement that was signed on 23 May 1951 and which gave China what Mao wanted-Tibet formally accepted that it was part of China and agreed to allow Chinese troops and officials to enter Tibet peacefully. The Chinese Communist Party (CCP) had achieved its paramount goal in Tibet-the legitimization of Chinese sovereignty over Tibet. In return, China agreed to allow the Dalai Lama and his government to continue to administer Tibet internally with its own laws and officials, basically as it had been doing up to then. At the same time, it also allowed the huge monastic establishment and the ubiquitous manorial estate system to continue to operate unchanged until such a time that the elite and masses in Tibet agreed to accept reforms. In other words, unlike in inland (neidi) China, where the traditional sociopolitical system and elites had been totally destroyed in the land reform movement right after liberation, in Tibet, Beijing agreed to allow the traditional sociopolitical system to remain intact for some unspecified time. Land and class reforms (called "democratic reforms" in Tibet) would need to be implemented eventually, but not until Tibetans were ready to accept such changes, although how to know when that point was reached was never clearly discussed let alone operationalized in the Seventeen-Point Agreement. Nevertheless, for the time being the CCP and PLA would have to work with the Tibetan government, not replace it. Mao's carrot, therefore, the Seventeen-Point Agreement, became the initial legal framework for Sino-Tibetan relations. Over the next six months, roughly eight thousand Chinese troops and officials peacefully entered Lhasa, receiving polite welcomes by the Dalai Lama and the Tibetan government. A new chapter in Tibetan history and Sino-Tibetan relations was under way. Incorporating Tibet territorially, however, turned out to be the easy part of China's goals for Tibet. The hard part was persuading the Tibetan elite and masses to have a positive attitude toward their new role as "citizens" of the PRC. Mao believed that long-term stability and security in Tibet were best obtained not by forcing compliance but by gradually winning over Tibetans. This ambitious goal of transforming Tibetans' attitudes was at the heart of Mao's top-down "gradualist policy." Mao understood that the elite had the most to lose by reforms and would be the most hostile to them, but he also believed that trying to bypass the elite by going directly to the masses, although theoretically a possibility, was unlikely to yield positive results because of the backwardness of the masses and the powerful influence of religion-lamas and monks-over their attitudes and beliefs. The CCP's options in Tibet were also limited because there were virtually no Han in Tibet who could be counted on to help them. Consequently, Mao was convinced that in Tibet the CCP's initial efforts should concentrate on winning over the elite, especially the young Dalai Lama, rather than rushing to push for reforms using their theoretical natural allies, the masses. To facilitate this, Mao emphasized that when Tibet underwent reforms, these would be what he called "peaceful" reforms, in that the elite would receive compensation for their property and would be guaranteed subsequent income comparable to what they were accustomed to in the old society. In addition, the humiliating and vicious militant "struggle sessions" that were inflicted on the elite in inland China would not be held in Tibet. Many in the elite, in fact, were to be given positions in the new socialist institutions. Mao's gradualist strategy, therefore, prioritized pragmatism over ideology and stipulated that work should proceed slowly and cautiously with respect to making changes to the traditional society. The cadres working in Tibet, therefore, were instructed repeatedly not to let their ideological enthusiasm for creating a fully socialist China impel them to start reforms in Tibet prematurely-that is, before the elite were ready-even if that meant having to leave the traditional system in place for some years. In the meantime, the CCP cadres were to treat the elite with respect and cordiality, despite their ongoing exploitation of the Tibetan masses (in the CCP's view). Deng Xiaoping's final instructions to the Sichuan troops under him who were about to leave for Tibet in 1950 illustrates this emphasis: "If the soldiers go to Tibet with the ideal of class struggle in their heads [as they did in the Han areas], when they get to Tibet and see the exploitation of the landlords they will become very anxious to intervene [and] so will do something against our [gradualist] policy. Therefore, in order for that not to happen, go to Tibet with one eye open and one eye shut." In the beginning, we were soldiers, but after arriving in Tibet we took off our uniforms and we became civil cadres. At that time, the discipline was very tight. We were not allowed to go to market recklessly. In those days, there were many times when the masses beat us with their fists and spit on us. We just had to clean up the spit and leave. We were not allowed to fight and scold them. The reason for tolerating this was the hope of leading them on a good path [winning them over]. Local Tibetans had not known what to expect from these "Red" Chinese and so were pleasantly surprised by their mild-mannered and well-disciplined behavior. That, however, did not change the fact that they were still aggressors who had invaded Chamdo, killed many Tibetan troops there, and forced their government to accept Chinese sovereignty over Tibet. So together with some relief that the behavior of the Red Chinese was better than expected, they also felt anger and resentment at what had befallen Tibet. They feared, too, that the initial good behavior of these atheist Communists was not genuine, and that soon their true colors would show and Tibet's great religion and way of life would come under attack. The Tibetan elite initially responded to the presence of thousands of Han Chinese troops and officials in Lhasa and elsewhere in Tibet in a number of different ways that can roughly be aggregated into four broad categories. The Kashag (Council of Ministers) was the main administrative office in the Dalai Lama's government, and was the Tibetan government office that would deal directly with the Chinese in implementing the Seventeen-Point Agreement. Although the Kashag strongly disliked the large Chinese military presence in Tibet, Tibet's hopeless military and diplomatic position led them, like Mao, to conclude a pragmatic strategy should be utilized, so they tried to make the best of this bad situation by developing good working relations with the Chinese officials in keeping with the agreement. The kalöns (Kashag ministers) hoped that by acting cordial, cooperative, and professional, they could gain influence with the Chinese, which could affect the extent and rate of change that the traditional religious, political, and social institutional spheres would have to undergo. By contrast, they felt that angry confrontation and opposition might provoke the PLA to go on the attack and destroy traditional Tibet.One of the kalöns, Lhalu, explained that, in the first year, "I didn't think that the old society could continue, but I also didn't think that it would vanish at once. I thought that the reforms would occur slowly, over time." So the Kashag set off to pursue a strategy of working cooperatively with the TWC. On the other hand, there was a second, quite small, segment of socially progressive government officials who had a very different view. Their desire for change and modernization had been thwarted by the religious conservatives who had thoroughly dominated the Tibetan political system for decades, so for them the arrival of the Chinese was a long-awaited opportunity to finally develop and modernize Tibet-for example, start newspapers and build schools, hospitals, roads, and the like with the help of the Chinese. A third segment of the elite was exemplified by the two sitsabs (acting chief ministers) who openly and actively sought to oppose the Chinese however and whenever they could. For these hard-line nationalists, whether or not the Chinese improved life in Tibet by building new schools or roads did not change the fact that the Chinese had invaded their peaceful country and were occupying it against the will of Tibetans. They wanted not "some" autonomy under close Chinese Communist control but complete freedom as had existed before 1951 in the de facto independence era, or at least the loose protectorate status they had held during the Qing dynasty era. Getting the Chinese troops and officials out of Tibet, or at least all but a small contingent, therefore, was their goal, and for the first year they tried hard to pressure the Chinese to revise the agreement and withdraw most if not all of their troops. In essence, the two sitsabs were working at cross-purposes with the Kashag, and neither office coordinated their activities. By mid-1952, the sitsabs, working with the newly created Tibetan "People's Association" (which is discussed in chapter 2), had brought Lhasa to the verge of open violence. At this point the Kashag intervened to restore calm by persuading the Dalai Lama to remove the two sitsabs from power as the Chinese were demanding. Finally, most of the Tibetan government's lay and monk officials-that is, most of the elite-thought much like the Kashag. They did not want to be part of a Communist China and did not want a large contingent of Chinese troops stationed in Lhasa, but they did not see confrontation and violence as a useful strategy for dealing with the militarily dominant Chinese. As mentioned earlier, they had found that the Chinese troops and officials were not nearly as bad as they had previously feared. Troops and officials were showing great restraint in dealing with the populace and were not stealing or looting or bullying Tibetans, and unexpectedly they were also showing respect for core Tibetan institutions such as monks, monasteries, and temples. So in day-to-day life, the Tibetan government was administering Tibet much as it had been doing before their arrival, and its monk and lay officials were simply continuing to perform their government jobs as before, leaving the big decisions about Sino-Tibetan relations to the Kashag and the Dalai Lama. In order to ensure the implementation of this agreement, the Central People's Government shall set up a military-administrative committee and a military area headquarters in Tibet, and apart from the personnel sent there by the Central People's Government shall absorb as many local Tibetan personnel as possible to take part in the work. Local Tibetan personnel taking part in the military-administrative committee may include patriotic elements from the local government of Tibet, various districts and leading monasteries; the list of names shall be drawn up after consultation between the representatives designated by the Central People's Government and the various quarters concerned, and shall be submitted to the Central People's Government for appointment. Despite the fact that this would not replace the Tibetan government and was specified in the agreement, the Tibetan side strenuously objected to implementing this change, so Mao, in keeping with his gradualist policy, decided it was best not to force this and backed off, placing the plans for the Military-Administrative Committee in abeyance. As a consequence, during the 1951-55 period, the Chinese side had no separate governmental organization in Tibet, and the TWC, which was the Communist Party organization in Tibet, took on this role. It initially drew its members from the northwest and southwest army troops; and while shallow in organization in the beginning, it quickly grew and expanded with deployments from the Southwest Bureau in Chengdu and the Northwest Bureau in Lanzhou. However, the CCP won a minor symbolic victory when a "joint" Tibetan Area Military Headquarters was established in February 1952 with two kalöns (Ngabö and Ragashag) being appointed vice commanders in the PLA. Here too, however, they lost out on the main issue when the Tibetan government refused to place what was left of the Tibetan army under the jurisdiction of this military headquarters. Tibet, therefore, in the period covered by volume 2 (1951-55) of A History of Modern Tibet, continued to be governed internally by the traditional (Dalai Lama's) government, which basically made all decisions regarding its own land and people as it had before 1951. The Dalai Lama's government continued to recruit, train, and promote its own officials and administer its laws internally through its own system of districts. It also adjudicated disputes and prosecuted and punished criminals according to its own laws, and it even created new offices, such as its own "Reform Office." Similarly, the Dalai Lama's government collected and utilized taxes as before and not only continued to utilize its own currency but also refused to utilize Chinese paper money, accepting only Chinese silver dollar coins (Ch. dayan). On top of that, four divisions of the traditional Tibetan army (about three thousand troops) were still intact and continued to use their own uniforms and weapons and carry their own flag (which was almost indistinguishable from what now is the Tibetan national flag). Its army officers were appointed by the Tibetan government through its own Military Command Headquarters, so the PLA had no administrative control over the Tibetan military. It is not possible to fully understand contemporary politics between China and the Dalai Lama without understanding what happened in the 1950’s. 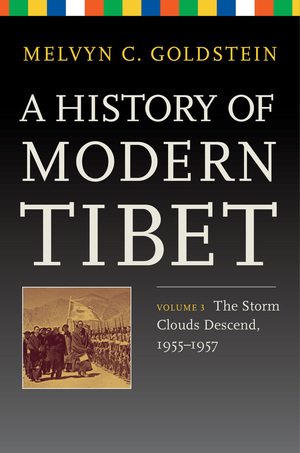 The third volume in Melvyn Goldstein's History of Modern Tibet series, The Calm before the Storm, examines the critical years of 1955 through 1957. During this period, the Preparatory Committee for a Tibet Autonomous Region was inaugurated in Lhasa, and a major Tibetan uprising occurred in Sichuan Province. Jenkhentsisum, a Tibetan anti-communist émigré group, emerged as an important player with secret links to Indian Intelligence, the Dalai Lama’s Lord Chamberlain, the United States, and Taiwan. And in Tibet, Fan Ming, the acting head of the CCP’s office in Lhasa, launched the “Great Expansion,” which recruited many thousands of Han Cadres to Lhasa in preparation for beginning democratic reforms, only to be stopped decisively by Mao Zedong’s “Great Contraction” which sent them back to China and ended talk of reforms in Tibet for the foreseeable future. 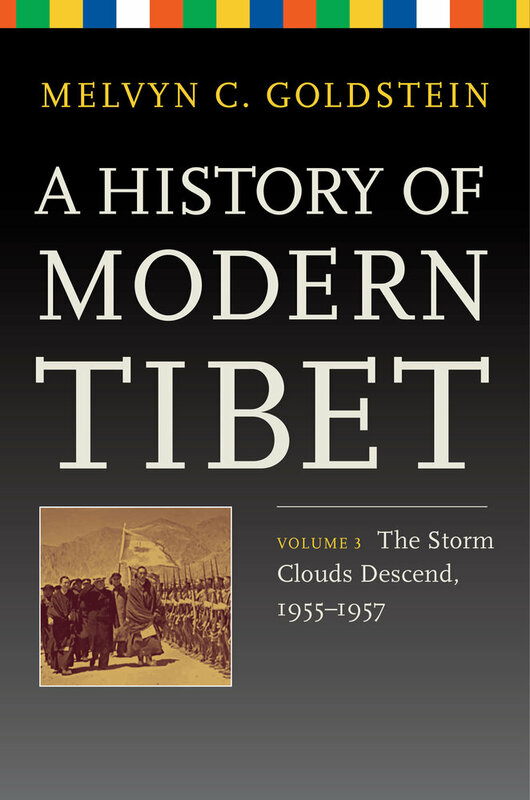 In Volume III, Goldstein draws on never-before seen Chinese government documents, published and unpublished memoirs and diaries, and invaluable in-depth interviews with important Chinese and Tibetan participants (including the Dalai Lama) to offer a new level of insight into the events and principal players of the time. Goldstein corrects factual errors and misleading stereotypes in the history, and uncovers heretofore unknown information on the period to reveal in depth a nuanced portrait of Sino-Tibetan relations that goes far beyond anything previously imagined. Melvyn C. Goldstein is John Reynolds Harkness Professor in Anthropology, Codirector of the Center for Research on Tibet at Case Western Reserve University, and a member of the National Academy of Sciences. He is the author of many books on Tibet, including A Tibetan Revolutionary: The Political Life and Times of Bapa Phüntso Wangye (with Dawei Sherap and William R. Siebenschuh), Essentials of Modern Literary Tibetan: A Reading Course and Reference Grammar, and volumes 1 and 2 of A History of Modern Tibet, all published by UC Press.